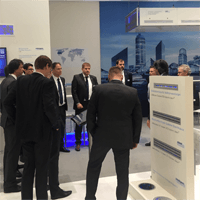 With a record number of visitors and many also new international contacts the exhibition appearance ended successfully at this year’s ISH in Frankfurt. 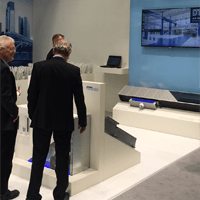 We were able to inspire and convince with our new products and present our experience and competence of the LTG engineering services. Under the motto „IntelligentIndustry“ LTG presented its newly developed industrial air diffuser ILQsf for energy-saving on-demand ventilation for industrial buildings and warehouses as well as the highly inductive side-wall diffuser, circular nozzle and adjustable swirl diffuser for large halls and rooms. 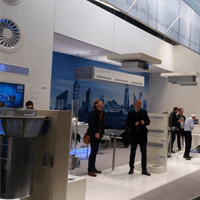 As an exhibition premiere LTG’s ceiling jet diffusers MSA for metal- and cooling ceilings and the Fancoil-/ Diffuser-Combination VKL SystemIndivent for ceiling application were on display. Additional focus was highlighted through our decentralised air conditioning. Besides pulsing facade ventilation FVP for underfloor installation LTG now offers a sill solution with this technology. The currently introduced products also include the new decentralised ventilation unit FVS Eco2School with even higher airflow. 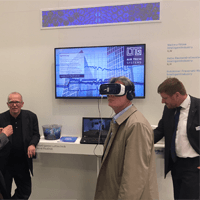 Get more of a virtual impression from the LTG booth as well as insights into our laboratory and innovations. Just scan the QR-code and experience LTG live!